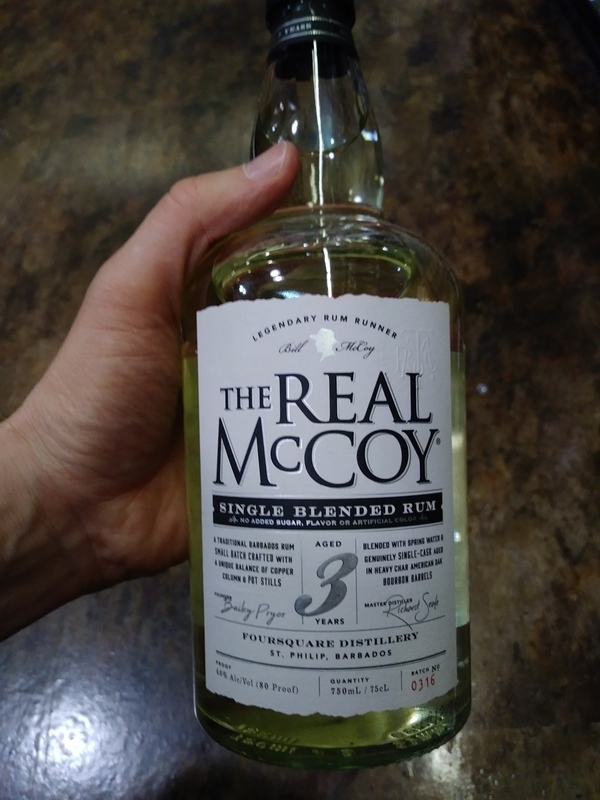 Have you found an online vendor selling The Real McCoy 3-Year? A relatively neutral nose with subtle unripe fruits like pineapple and banana. Perhaps a little hint of coconut in there as well. The palate is light, delicious and refined with a hint of the fruity notes mentioned above. Leans towards the dry side but not in a tannic way. Great refined white, is you need something that doesn't stand out to much in your cocktail. Can be had neat as well. Toasted coconut, fresh fruit, crisp clean white with much more flavor than the most popular over-distilled neutral spirits that take up most of the white rum shelf space. To be fair, I'm biased. I'm not the biggest fan of white rum. That said, I take no pleasure whatsoever in drinking this without a mixer. Ting makes it better. Had a rum tasting on a sunny afternoon, because why not. The Real McCoy 3y rum bottle and label design is very lame and boring. Harsh alcohol and drain cleaner to the nose and palate. Awful burn at the end. Mix it with Coke and down it goes but just barely. Attended a tasting seminar for The Real McCoy at Cardiff Rum Festival on the weekend. Was incredibly well presented telling us of the provenance of the name being of Bill McCoy and rum running schooners. Looking for a premium tequila at my favorite liquor store, it had been a while since I checked their rum section. I expected to find nothing after having rated 107 rums, but there it was! All three of The Real McCoys; 3 year, 5 year, and 12 year. I already tried the 5 year and did not care for it's heavily wooded flavor, so I bought the other two. I had to test this 3 year old "white" rum against my favorite white rum known as Cana Brava 3 year old from Panama. No contest due to the heavy initial burn on my tongue from this Real McCoy. How it gets it's pale yellow color is beyond me. On another note, the current obsession with completely dry rums puzzles me. Yes, if one plans to sip these neat, then by all means go for it. However, very few of these dry rums (including this one) are good enough to sip neat. Feeling ripped off in buying this bottle, I used 12 ounces of it to make a 24 ounce batch of original daiquiris. This is one of sour (lime juice), two of sweet, (simple syrup), three of strong (rum), and four of weak (ice added later). With that much simple syrup added, this drink now has more added sugar than one of those sugar bombs. So even if these dry rums are not used to make daiquiris, there is no doubt that whatever is added as a mixer will contain sugar. Can I say, "Colossal DUH!!!!"? And by the way, this rum is not good enough to drink on the rocks. Having no additives is it's only selling point, which is only an excuse to jack up the price beyond what it is really worth. There are at least six white rums that I would rate better than this one. It is not the worst white rum that I tried, but when price is considered, I will never buy it again. Very well balanced, creamy texture, and with subtle hints of fruit and vanilla. Mixes nicely as a daiquiri, and sips just fine on its own as well. Something tells me it might be good with some cola, but haven't tried it... For $18, no reason to complain. Clean nose. Honestly not much flavor but smooth with no burn. Definitely best for mixer. Den rom egnet sig bedst til drinks. Duft af kokus og vanilje. Lidt sprit. Sødme, kokus og vanilje smag. It tastes lovely—trademark Foursquare, magnificent blending and balanced sweetness with just a hint of oak. Might be a higher rataing were it not for some alcohol on the nose, which (strangely) only seems to intensify with time. The 40% ABV is also a little weak; fix the alcohol nose, then crank it up a notch, and you've got a real winner. Still, it's head and shoulders above the big brands, and highly recommended. I've been trying this for several weeks, and I just can't put it up there with my faves. I have to say there are many others of like, or better, tastes that are less expensive. Not much sweetness at all. For a sipper, I'm going to choose something golden or dark. This can mix well, but save a few dollars and choose another. If you want to focus on rums that have no additives, give it try, but even then . . . This is a excellent white rum. Great sipper, full of that classic rum flavor. This rum has an incredible finish straight up. Not badly priced either.